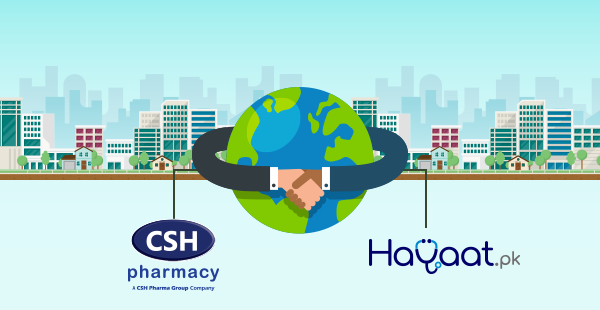 Hayaat.pk, a digitally driven healthcare platform, and CSH Pharma Group have recently announced a partnership where the users of Hayaat.pk will be able to get prescription medicines delivered to their homes or workplaces. The procedure is very simple – all the users have to do is send a picture of the prescription to Hayaat.pk through the mobile app and they will forward it to CSH Pharmacy. CSH Pharmacy will deliver the medicines to the provided address in no time. Nothing can get simpler than that! The foundation of this partnership is based on the fact that a lot of customers prefer to find products online due to a shortage of time and other factors. Moreover, the recent scams have made it difficult to find authentic medicines. In Pakistan, it is a challenging task to order medicines online but CSH Pharma and Hayaat.pk are making it happen. Hayaat.pk is a convenient, safe, and legal way to find a doctor and book an appointment online. Within a short period of time, Hayaat.pk has managed to create a positive change in the industry and helped so many people get access to healthcare facilities remotely. Not only can the users book an appointment with a doctor, but they can also find emergency centers, find blood donors, get answers to health questions, and find valuable information on the Health Blog. With this partnership, the users will now be able to get medicines also. “We have been working for more than a decade now and take pride in offering genuine medicines to the general public. As we all know that customers prefer online purchases and it was a good opportunity for us to partner with Hayaat.pk that knows this business and above all, are trying to play a vital role in improving the healthcare services in the country.” He further said, “This collaboration is not about offering medicines only, we will look to add more features in the near future,” says Mr. Usman Farooq, Manager CSH Pharma Group. With partnerships like this, the future of healthcare sector in Pakistan looks bright and we are quite optimistic that the situation will get better and patients will be able to find improved healthcare facilities.